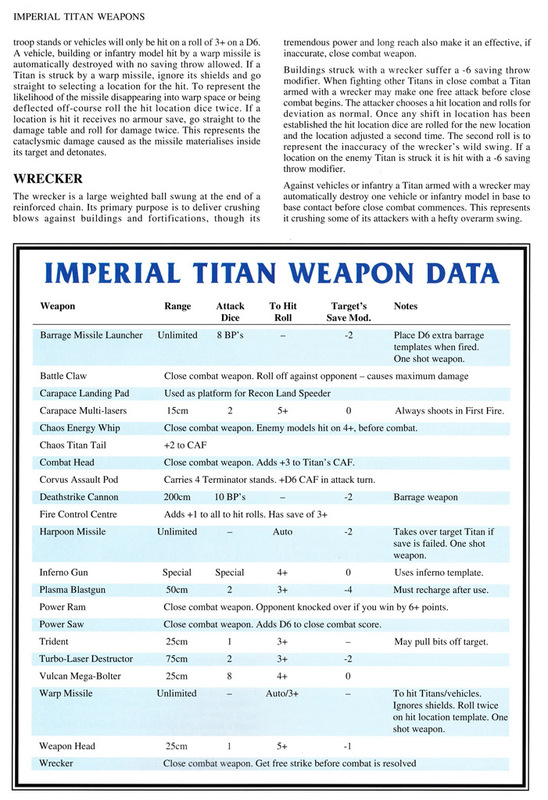 Today we look back 23 years at the exotic titan weapons that blasted and stomped across tabletops in 1993. 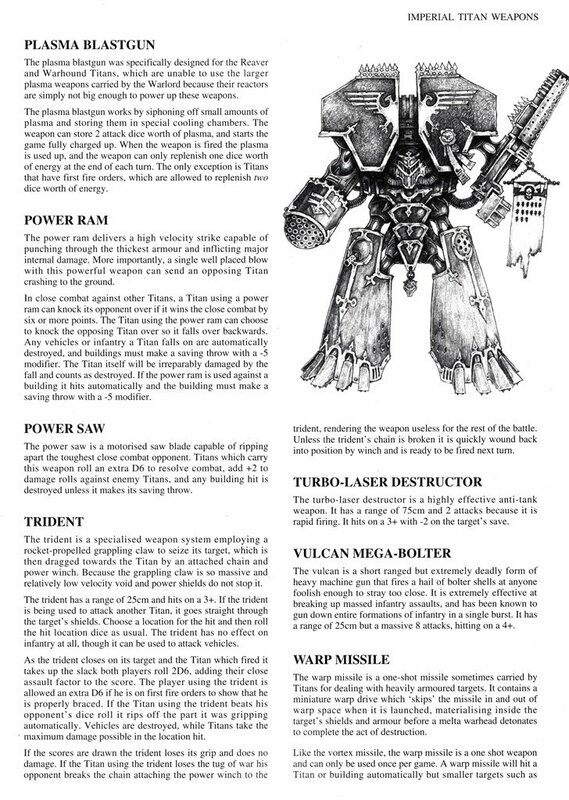 EPIC got it’s start with the very early Adeptus Titanicus from 1988 . 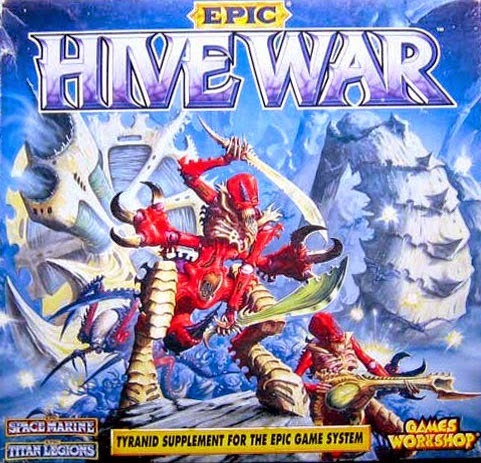 That was a titan-only affair soon to be reinvented by Specialist Games. 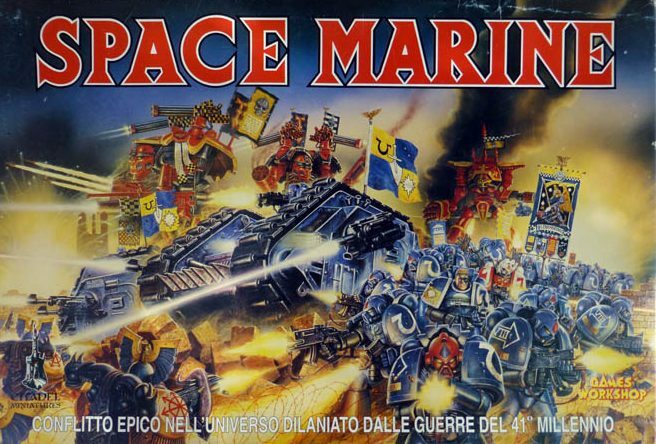 EPIC quickly grew into a full GW franchise with two editions of EPIC Space Marine in the very early 1990s. It was a wonderful era of creativity and all manner of minis and equipment appeared, many of which have disappeared into the mists of time. 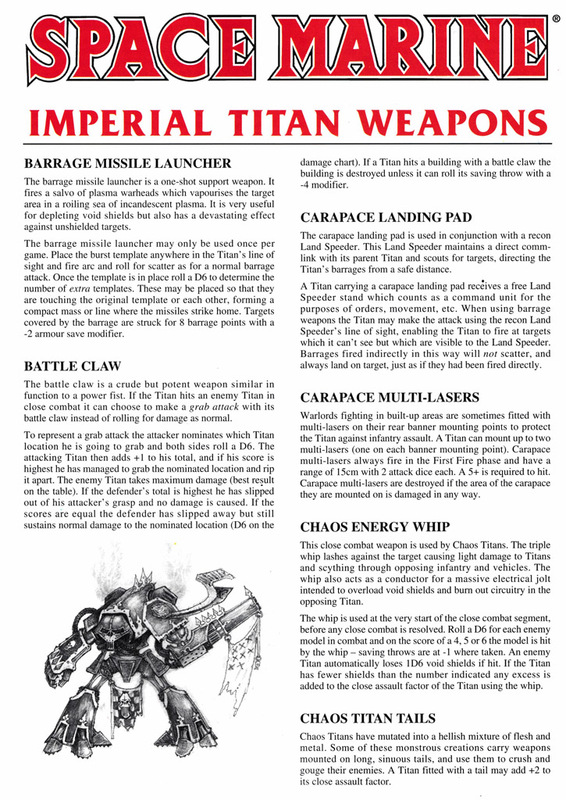 Today we take a look at a set of very non-standard titan equipment and add-ons that let you really expand what your God-Machines could do on the tabletop. 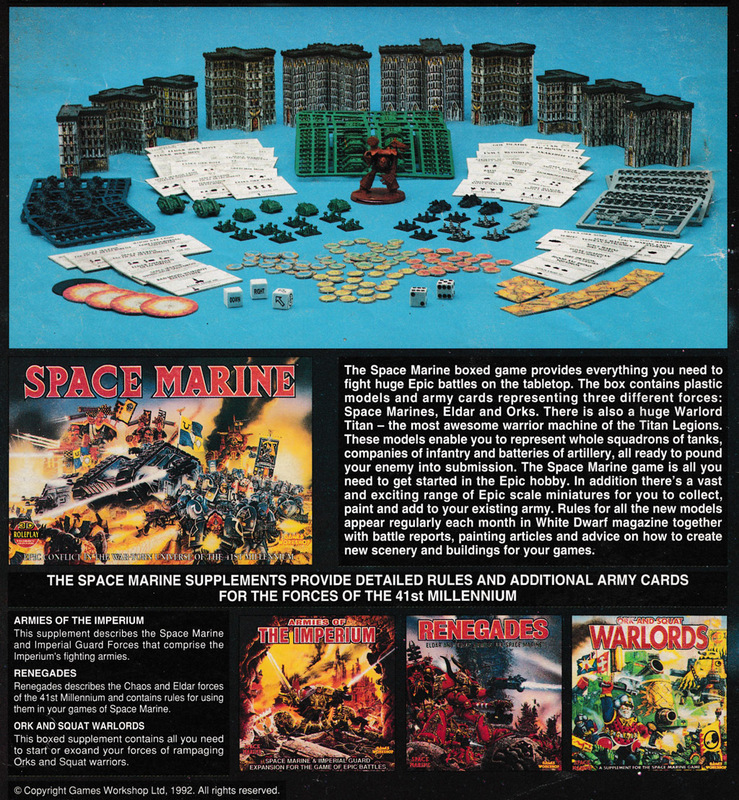 Who still has some of these bits lying around your dusty shelves? Now let’s dive into the background and rules for all that stuff up there. You can ignore the rules, as the background is great enough. 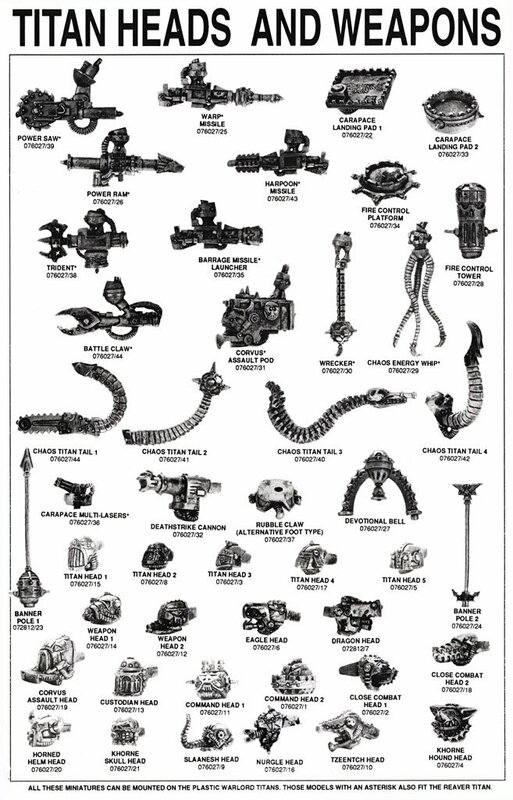 Who knows one day Forge World may bring some of these exotic pieces of kit back in either Adeptus Titanicus or full 28mm scale! Here we see two of my favorites, the Barrage Missile Launcher – bane of massed infantry formations. 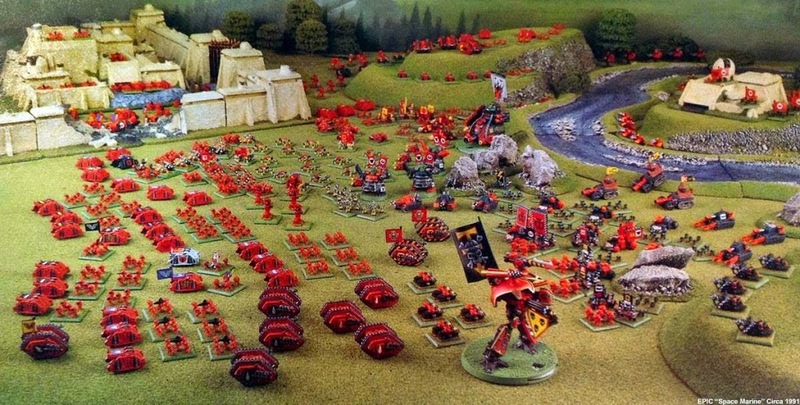 I once saw one of those unleash a full 7 blast templates on a full IG infantry company caught on the open field – most satisfying! Next up is the funky Carapace Landing Pad – which came with a free Land Speeder. 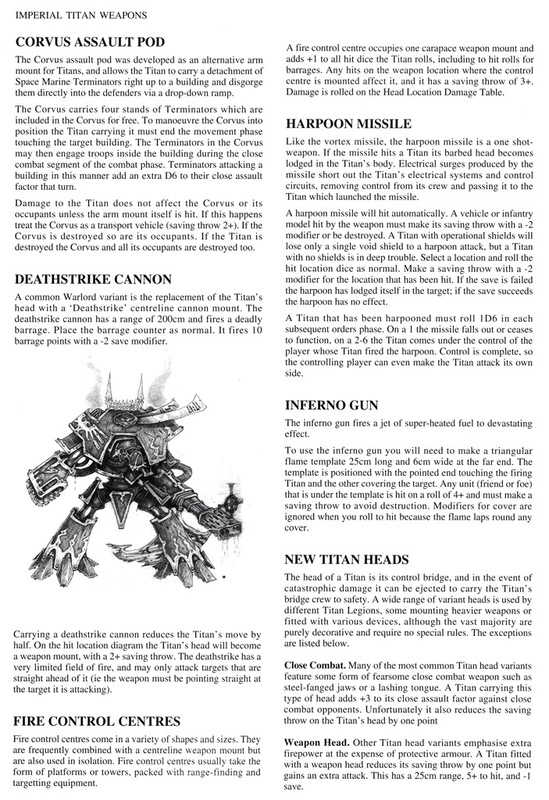 It looked cool atop a Warlord, then could dart out to allow non-LoS firing solutions to it’s host titan. Lots of tricks to be had when city-fighting with that one. There is a lot of coolness on this page, but you can read all of it AFTER we talk about the Corvus Assault Pod. Only the Imperium would devise a giant mouth/assault ram full of 20 Terminators just waiting to get shoved into a building. Needless to say, there were very, very few defenders who could fight off such a force – making the Corvus one of the most nail-biting risk-reward systems for capturing that enemy objective in a well defended distant building. It also looks AWESOME – scroll up and see. Now read the Harpoon Missile – YIKES! Here we see the dreaded Trident, a favorite for close-combat equipped titans. Seeing a hapless ranged weapon only titan get dragged into the loving embrace or a titan-powerfist equiped foe is really worth your time! Then we can move onto the highly feared Warp Missile.You only get the one shot but it ignores shields and if it hits… watch out – there will be fireworks! Finally we get to the Wrecker. The only thing better than operating a wrecking ball is attaching one to a titan and letting it swing! There really is no better way to take a building down in style than the Wrecker. Who knows what tricks that Warlord has up it’s sleeves. ~Thanks for this trip down memory lane folks. What are your favorite memories of the old EPIC?